If you haven’t seen the BBC documentary series “Planet Earth“, I highly recommend it. You’ll be wowed by the breathtaking beauty and wonder of our planet. I see stuffs like these and I’m amazed how some people can still hold to the belief that the planet was formed by chance (accident). We’ve seen that God’s priced creation is humans so why would He placed us here on earth when like we’ve mentioned several times we were made to be united with Him. In light of the past two weeks devo I’m sure there’re enough information to answer this question if you take the time to chew on them with God. You know, contrary to some popular teachings about Heaven; it’s not our permanent home. Let me say it this way: The supernatural realm called Heaven; where God’s throne is and where His presence is openly manifested actually is a temporary holding place for believers. Heaven in truth is wherever God is in person; wherever God throne is set and His Kingdom manifests openly. Guess what? God’s moving Home. 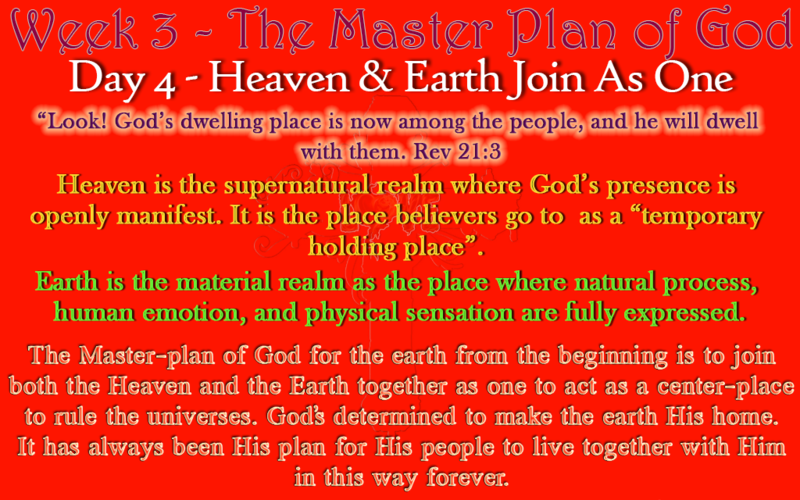 Th master plan of God for the earth from the beginning is to join the supernatural realm of heaven and the natural realm of earth as one to act as a center-place to rule the universes. This is another one of the mysteries Paul mentioned about. The desire of God to dwell among His people was shown with Moses building the ark of the covenant representing God’s very presence walking among the people. Others such as David, Isaiah, Habakkuk, all saw the glory of the Lord filling the earth as the waters covers the sea. (Exo 25:28, Num 14:21, Ps 72:19, Isa 6:3, Hab 2:14). The knowledge of the glory of the Lord filling the earth is the fullness His personality (being) filling the whole planet. God’s purpose has always been for His people to live together with Him in this way forever. This is the most difficult yet ultimate reality that God determined to accomplish through redemption. The dilemma is that God cannot violate His holiness or man’s free will in making a way for humans to live with Him on earth. This plan will come to pass. God will forever dwell with His people like He’d plan from the beginning. This is truly the centerpiece of His grand purposes; for Jesus to come back to fully establish His Kingdom rule over all the earth as He joins the heavenly and earthly realms together. Both dimensions coming together to fully express God’s personality and purposes. Today as you meditate on this; keep in mind that this the HOPE of your Christian faith. The hope that no matter what you’re going through now you are destined to Win & Reign, if you don’t give up. This is the message the Apostles used to encourage the saints in their generation to hold on their faith in the mists of great persecution and even death. In the coming days, God is going to give us deeper revelations on these as we will need them to go through what’s about to befall on the planet.